I want to with you, especially parents of teens, a free resource made available by Covenant Eyes. 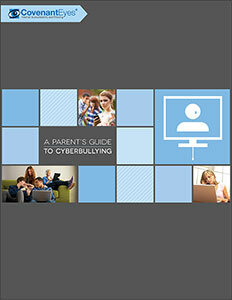 Covenant Eyes has put together a helpful ebook for parents about cyberbullying called A Parent’s Guide to Cyberbullying. 15% percent of teens have faced some form of cyberbullying in the past year. Cyberbullying is simply bullying being done online usually through social media outlets like Facebook and Twitter. Cyberbullying is extremely serious because what is said and done online cannot be erased. The effects of cyberbullying are just as permanent. I want toe encourage all parents of teens to please download and check this great resource out. All you need to do is click the link below and it will take you to the free download page on Covenant Eyes website. Next Post Is Jesus Really the Only Way?